It’s something construction manager dreads – a phone call late on a Friday about a construction problem. In this case, the call was about the fire damage to a precast concrete parapet wall on the roof of a large data center under construction in Fort Worth. With everyone onsite safe and hoping to avoid delay in the construction schedule, the client asked Terracon for an assessment of the wall to determine the extent of the damage. The Terracon Materials team collaborated with structural/materials diagnostics engineers from our Facilities Engineering team and after just two visits to the site, team members completed assessment field services including: limited visual condition assessment, ground penetrating radar (GPR) to detect voids beneath the concrete surface, concrete sounding to detect delamination between the concrete and reinforcing bars, and concrete core sampling. 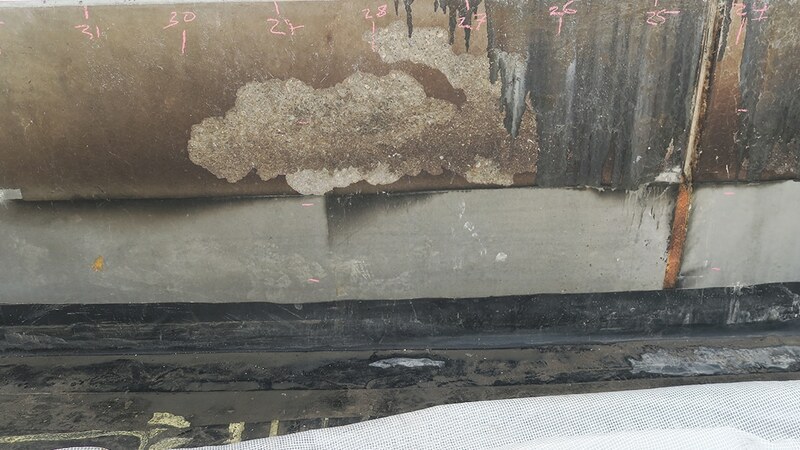 The concrete core samples were then delivered to the specialists in our in-house materials/petrography laboratory via overnight shipment for petrographic analysis to determine the extent of fire damage. During the limited visual condition assessment, our engineers photographically documented the distresses sustained on the concrete wall and determined the recommended areas for extracting concrete core samples. Concrete sounding was performed in accordance with ASTM D-4580 to detect potential suspect areas of concrete delamination that is indicated by a hollow sound when lightly striking the concrete surface with a hammer. GPR was performed in accordance with ASTM D-6432 using a Geophysical Survey Systems, Inc. (GSSI) Structure Scan Mini with a 1600 MHz antenna. The concrete core samples were extracted from the wall using a portable concrete coring machine. It typically takes two to three weeks for a petrographic analysis to be completed and the findings submitted, but in this case, the analysis was expedited, and findings were shared with the engineering team. Less than two weeks after the initial site visit, the client received a report of findings, which concluded that the fire damage was limited to the exterior 1/4-inch of the concrete wall, and the wall’s overall integrity was sound, except for the shallow spalled concrete damage initially sustained due to the fire. The client’s construction process was able to continue without any further interruption. Due to the wall being part of the manufacturer’s proprietary system, the client was advised to consult with the precast concrete wall manufacturer on the best practices for repairs. The client was able to make the necessary repairs recommended by the manufacturer without delaying construction, keeping the project on track despite the disruption of a fire. Petrographic examination can be used in conjunction with other laboratory tests to evaluate rock weathering and drilling/ripping behavior. 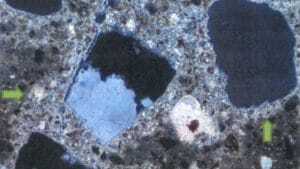 Petrographic analysis provides reassurance and confirmation materials meet specific requirements. Additionally, this analysis provides confidence in knowing materials will perform as expected while reducing project delays and future costly repairs. Determine the degree of damage to material. Terracon’s engineers, scientists, and technicians are knowledgeable of UFC and USACE criteria, manuals, procedures and requirements. Several USACE Districts rely on Terracon for Quality Assurance testing and sophisticated lab testing, including rock properties and petrographic analysis of concrete. Joanna Monge is a senior project engineer for the facilities service line in Terracon’s Houston-BES office. She is experienced in engineering analysis, design, and assessment of various concrete, steel, and timber structures for commercial, industrial, educational and government clients.